To order multiple items for discount...Click here to tell us which items you wish to purchase. Please contact us using your PayPal email address and we can send you an invoice. Items on this page may be purchased using your PayPal account, major credit cards , debit cards or bank transfers. The transaction takes place on PayPal's secure site even without a PayPal account. International customers: to inquire about shipping expenses CLICK HERE to send an email. Please let us know where you live and what you would like to order and we can send you a PayPal invoice. California residents please add 7.625% sales tax. 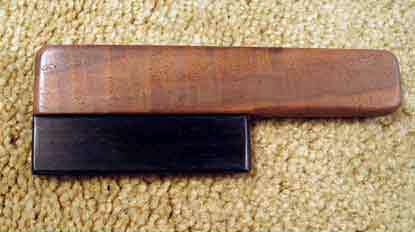 A small hand tool for polishing frets. We have used this tool for decades (although ours isn't this fancy looking) to polish frets after leveling and re-crowning. This necessary step takes a few minutes but the result is more than worth the time. Aside from just looking more "finished", the feel of playing on polished frets is something you and your customers will love. This deceptively simple tool has a Claro Walnut handle, an Oregon Myrtle shoe and comes with complete instructions on its use with your abrasives and the final polishing step without the use of a buffing wheel. This is a tool that securely grips frets with the assistance of your vise. Shown below in use with a Versa-Vise™, this tool works equally as well with any vise. 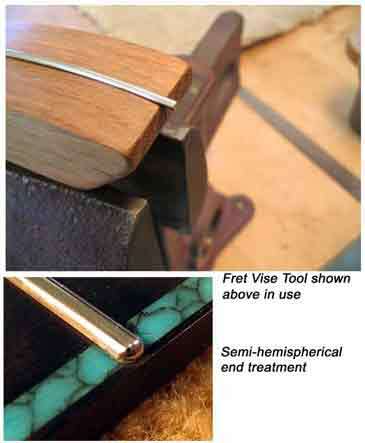 This handy tool has saved us countless hours trying to hold the fret still while shaping it, for example when finishing the end with semi-hemispherical shape. 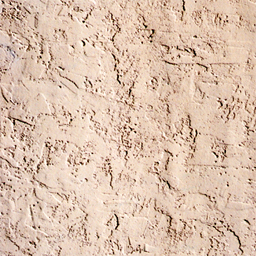 Complete instructions for use including how to create this great fret end treatment detail that your customers will rave about. Bench vise and fret material not included. This is the completed neck with the truss rod adjustable from inside the guitar. 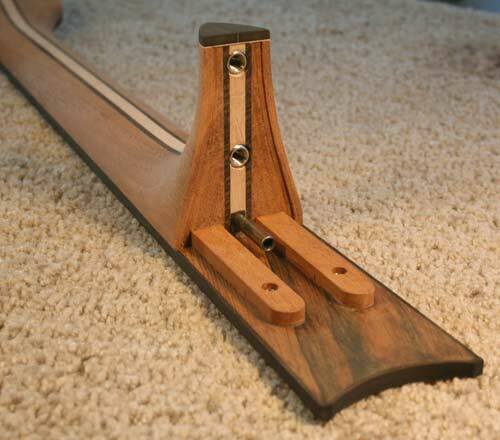 The mahogany alignment bars with threaded inserts are glued in a cavity routed in the neck/ body and glued to the underside of the fingerboard. Attachment to the body is achieved with the stainless steel inserts in the heel. 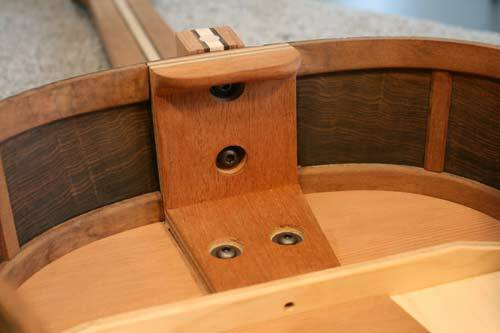 The fingerboard is attached to the top by means of the threaded inserts in the alignment bars. 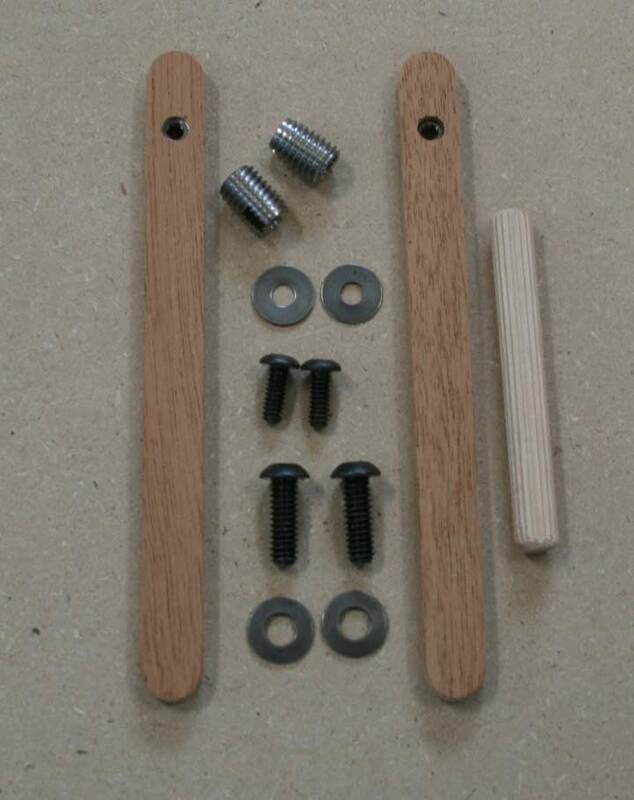 The kit includes two mahogany alignment bars with threaded inserts and all the fastening hardware which includes the stainless steel threaded inserts for the heel and Belleville spring washers to keep things in place. Not shown are the 5-page plans/instructions, 1 additional sheet with full size heel patterns, and a step-by-step internet help page to make this task easy for "one-off" builders or for those in a production environment. The kit does not include the truss rod or any parts for the neck or body. If you are returning to buy more of these kits and already have the instructions/drawings please indicate this and we will take $4 off the the price and not send out the drawings again. The kit does not include the truss rod or any wooden parts for the neck or body. Shown above with a 2-way truss rod that will be adjustable from inside the guitar, the rod can be reversed for adjustment at the headstock. 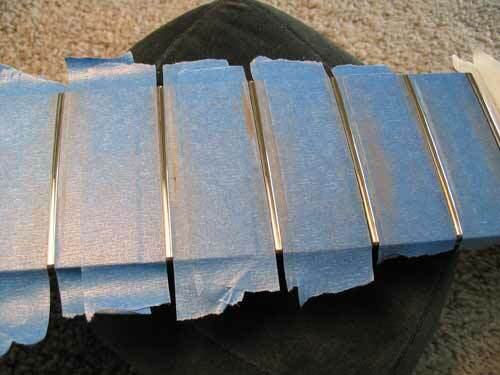 In the mid 80's, I began experimenting with mechanically fastened necks on my own guitars as many other builders did. Would there be a resonance or projection loss? Would the neck stay fastened to the body? That first prototype is still going strong. There was no resonance sacrifice. I have refined the connection many times over the years and have come up with a straightforward, easy to fabricate system. You don't need a lot of tools or fixtures. The neck stays aligned with the body centerline and it won't move. 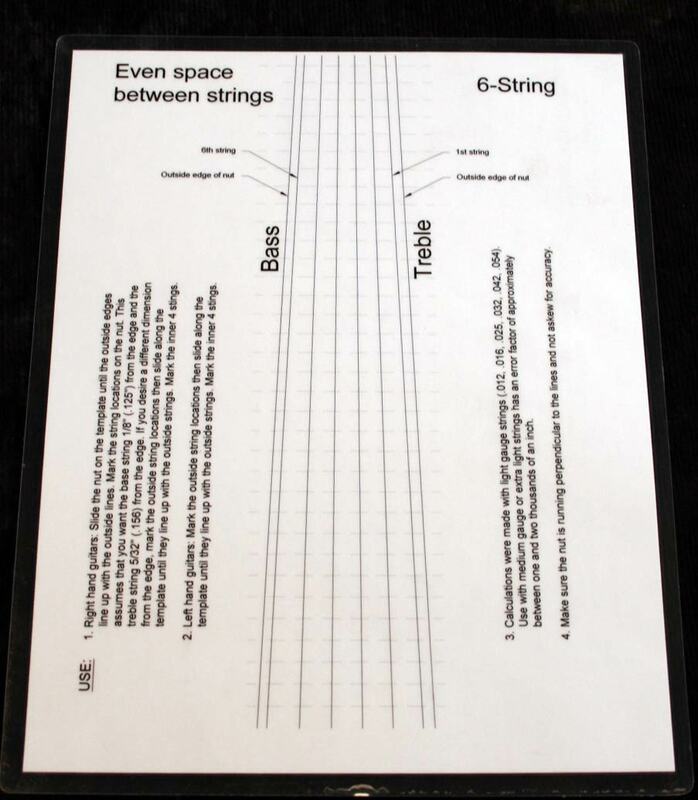 This is a tool designed to accurately and quickly determine the spacing of strings for the nut and bridge. 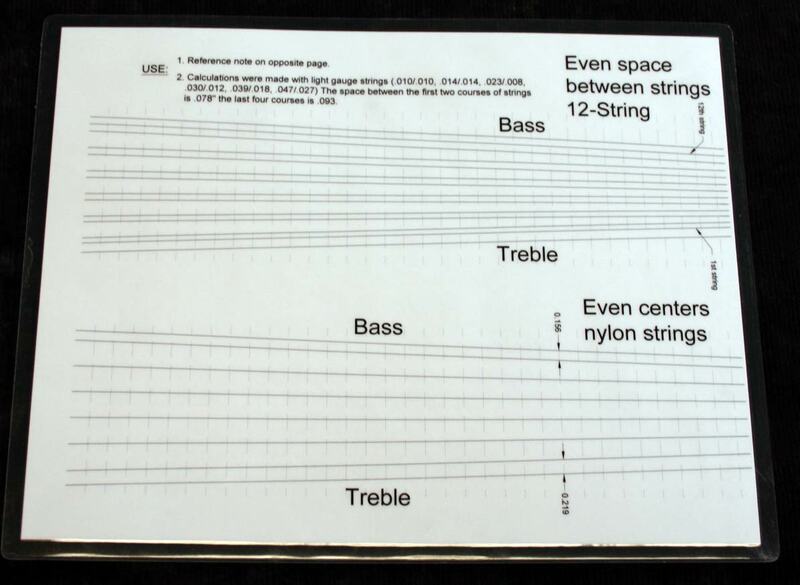 Most musicians prefer the space between the strings to be equal which is completely different from equal center lines which tend to cramp the bass strings together on steel string guitars. Created using AutoCAD, this gauge is extremely accurate. There is no need for calipers and calculators and the gauge is infinitely adjustable as opposed to incremental. Just slide the nut along the gauge until the outside edges line up with the outer lines and mark the string positions on the nut. The back side of the gauge is designed for laying out even spaced 12-string guitars and even centered nylon string guitars. It measures 9" x 11 1/2" and is plastic laminated for durability. The front gauge is designed to layout even spacing on 6-string guitars between 1 1/2" and 2 3/8" at the nut. The rear/top gauge accommodates 12-string guitars between 1 1/2" and 2 3/8" at the nut. 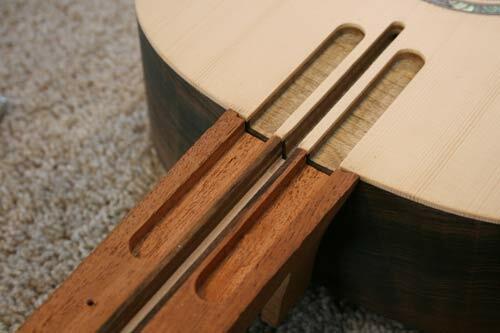 The rear/bottom gauge is for equally centered nylon string guitars between 1 3/4" and 2 1/2" at the nut.